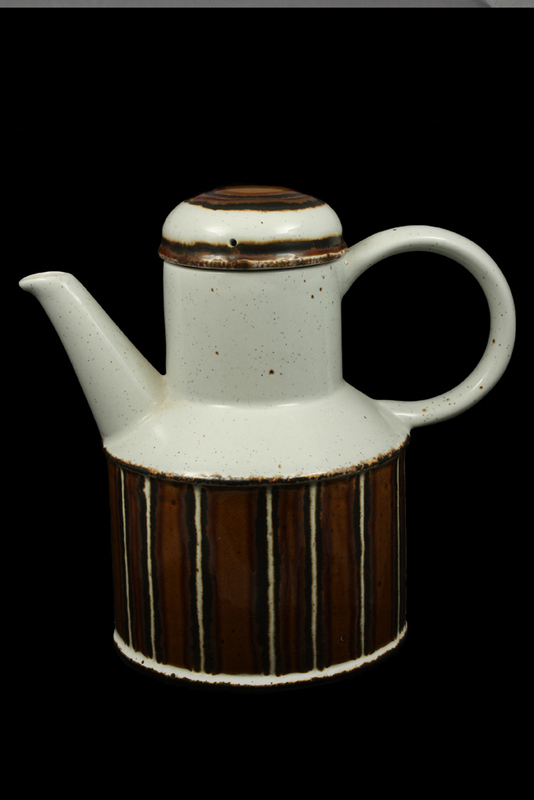 The Midwinter ware from the pre-Second World War and immediate post-war periods are of good quality, but are conventional and of relatively little interest to collectors. 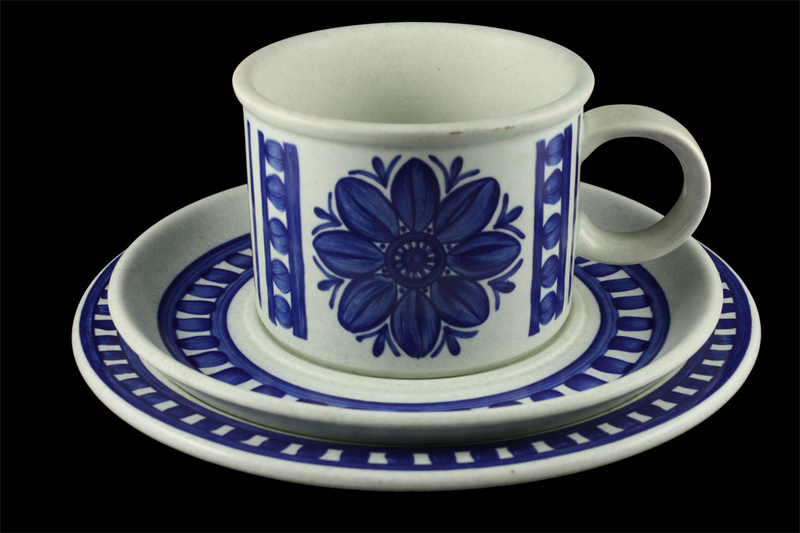 The Pottery was a mid-size manufacturer of tableware in the 1930s and there are some art deco patterns that would be of minor interest to collectors. 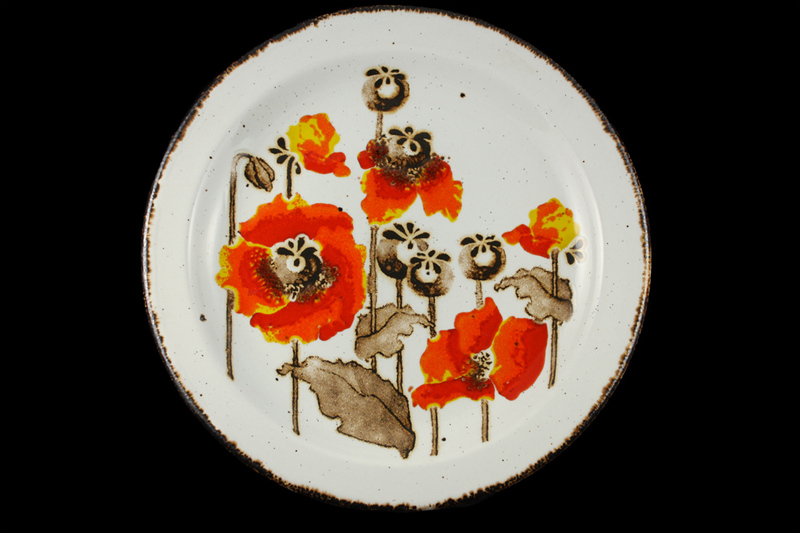 From the end of the Second World War in 1945 until the advent of Stylecraft in 1953 the Pottery continued with mainly plain whiteware for the UK market (until restrictions were lifted in 1952) and conventionally decorated ware – floral patterns, gilding and banded wares for export. Stylecraft was introduced in 1953 and was the first of the ‘modern’ Midwinter wares. In summer 1952 Roy Midwinter had returned from a sales trip to Canada disappointed in the reception of the company’s offering, but with advice to examine the shapes and patterns being produced by new, young designers in California. On a subsequent visit to California Midwinter saw and embraced the work of designers such as Eva Zeisel, Russel Wright and Raymond Loewy that were designing new fluid organic forms very different to the tableware of the pre-war era. The result was ‘Stylecraft’, a modern shape that differentiated itself in the market, yet was practical and ‘not too different’. The range was released in February 1953 with ’40 shapes and 36 contemporary patterns’. The plates and other flatware were ‘squared’ with a narrow rim. Jessie Tait produced the great majority of patterns for the Stylecraft range. Best known today are Homeweave, Primavera, Fiesta, and Red Domino. Also of note are the collectible ‘Riviera’ based on sketches made in France by Sir Hugh Casson (later re-launched as ‘Cannes’ on the Fashion shape), and the zoologically accurate ‘Wild Geese’ wildfowl studies prepared by Sir Peter Scott of the Slimbridge Wildfowl Trust and produced in association with Jessie Tait. The Stylecraft range continued in production into the early 1960s. The Fashion shape, released in 1954, took the Midwinter look to another level. The shape fully embodied the organic modernism of the American designers. The flatware was now rimless - regarded as a bold step at the time – and the pots and bowls had free-flowing, fluid lines. 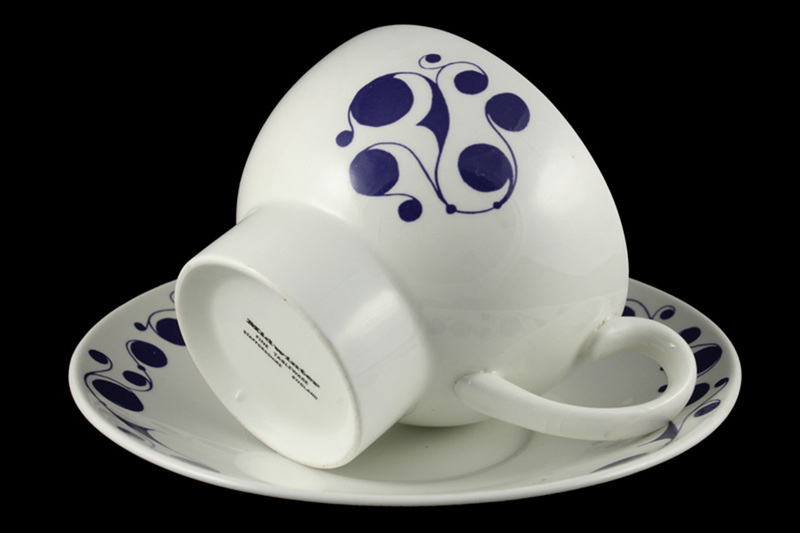 Confusing for collectors, but perhaps understandable at the time, advertisements and backstamps often refer to ‘Stylecraft Fashion tableware’ or ‘Stylecraft Fashion shape’, as a way of introducing what was a very bold shape to a conservative public. There are at least 120 patterns recorded on the Fashion shape including many Stylecraft originals. Well known are the Sir Hugh Casson’s ‘Cannes’, a reworking of the popular ‘Riviera’ pattern introduced on the Stylecraft shape in 1954; ‘Nature Study’ (1954) and ‘Plant Life’ by Terence Conron; and ‘Pierrot’ and ‘Zambesi’ by Jessie Tait. Sir Peter Scott of the Slimbridge Wildfowl Trust also worked with Jessie Tait to design a series of zoologically accurate wildfowl studies including ‘Wild Geese’ John Russell and Eve Midwinter also designed successful patterns for the Fashion shape. The shape was produced into the late-1960s. 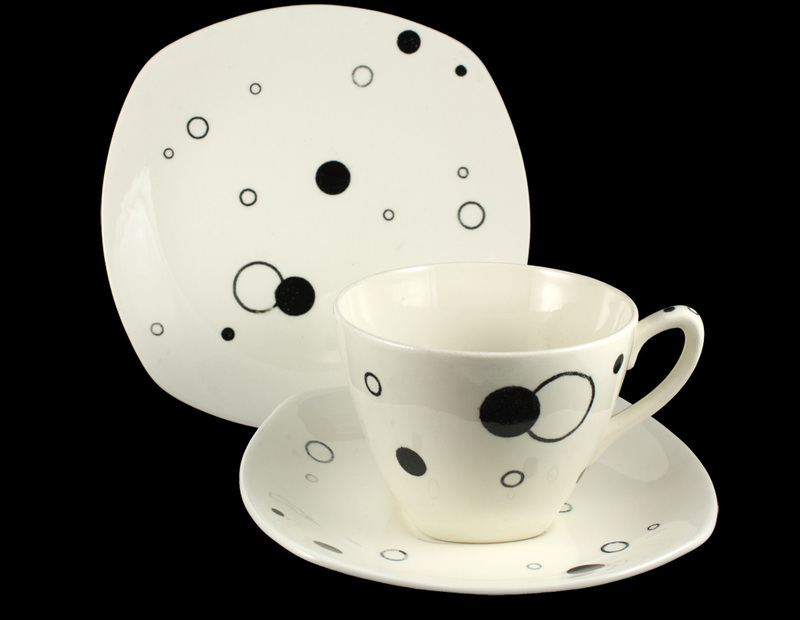 In 1962 Midwinter introduced the ‘Fine’ shape, designed in collaboration with Lord David Queensberry (later Marquis Queensberry), then a Professor at the Royal College of Art and the leading exponent of modern design in domestic ceramics. The shape distanced itself from the American-inspired organic modernism and was based on a simple cylindrical shape. The ‘Fine’ range was released in early-1962 and the first six patterns were marketed initially as the Queensberry range. The Fine shape’s large, clean surfaces were attractive to designers and there are approximately 70 patterns, most notable, perhaps, being Jessie Taits’s ‘Spanish Garden’, the most popular of all Fine patterns, ‘Country Garden’, Mexicana’ and ‘Sienna’. Other popular and collectible patterns are ‘Roselle’ by Even Midwinter, and ‘Focus’ by Barbara Brown. The Fine shape was updated, removing the knob from the teaware to leave a flat surface suitable for decoration. This update was later termed the MQ1 shape and Fine/MQ1 remained in production until into the early 1980s. There is a detailed article on the development of the ‘Fine’ shape in the 1962 Pottery Gazette Volume 87, pages 945-949. The MQ2 shape, released in 1966 and designed primarily by the Marquis of Queensbury was a return to a curvilinear shape and not successful in the marketplace. Only four patterns are known of which ‘Pierrot’ by Nigel Wilde is the best known. The shape probably did not survive the 1968 takeover of Midwinter by J. 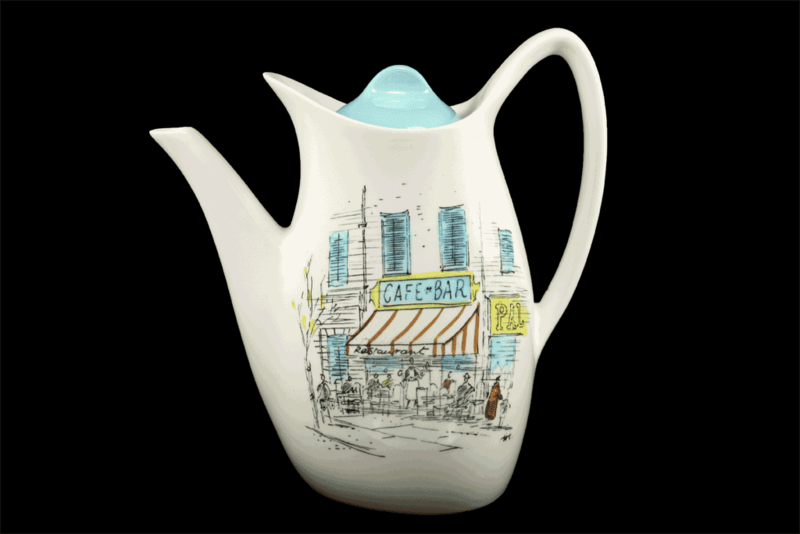 & G. Meakin Ltd. The Stonehenge range was designed by Roy Midwinter, modelled by the experienced company modelers Sydney and Derek Machin and was decorated with designs created by Jessie Tate, Eve Midwinter and other graphic designers. 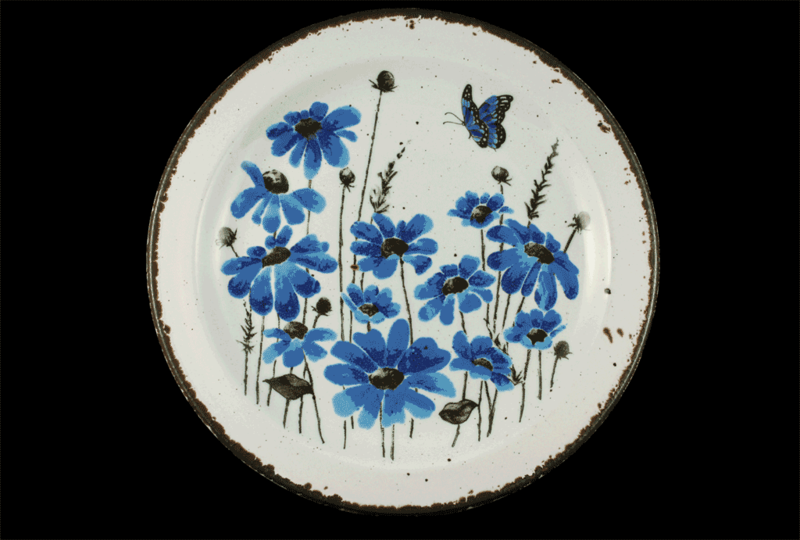 The range was launched in February 1972 with the release of four matt glazed patterns ‘Blue Dahlia’, ‘Bluebells’, ‘Flowersong’ and ‘Medallion’. So simple it generates its own sophistication. In these days of mass production it is so refreshing to find the slight variations in decoration normally only associated with expensive hand-thrown studio pottery. Each piece is unique. 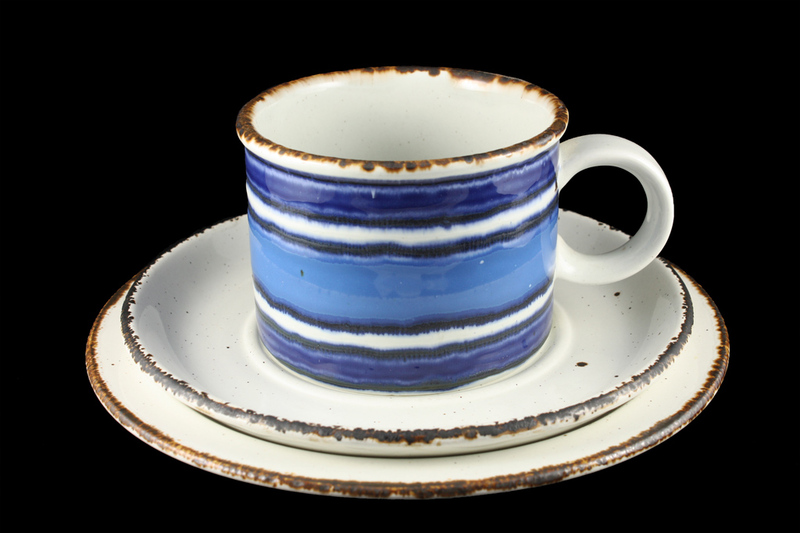 Although launched with a matt glaze, the majority of the Stonehenge range had a glossy ‘oatmeal’ glaze where reactive particles added to the glaze cause an irregular speckling over the surface of the ware. 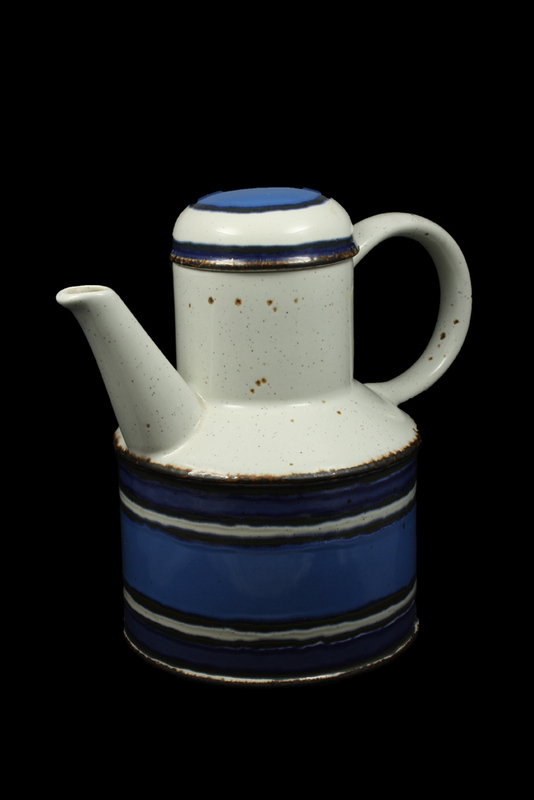 The wares were finished with hand-applied iron oxide banding to the edges that contributed to the ‘studio pottery’ look. Stonehenge connected immediately with the public spirit of the 1970s with the interest in self-sufficiency and birth of popular concern for environmental issues exemplified by the television comedy ‘The Good Life’ starring Richard Briars and Penelope Keith which screened between 1975 and 1978. ‘Sun’, ‘Moon’ and ‘Earth’ designed by Eve Midwinter and launched in early 1973 have become design icons for the period. 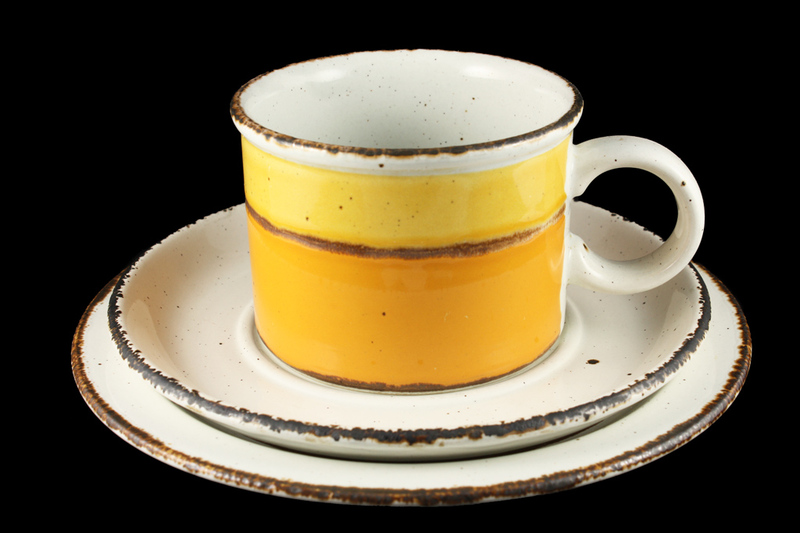 All of the features discussed above were supplemented by blocks of brilliant colour screen-printed and then applied to the ware. ‘Creation’ – the plain, undecorated ware (possibly first known by the name ‘Stella’), complemented the striking patterns. Jessie Tait and Eve Midwinter were the main pattern designers for Stonehenge and of the 60+ known designs, the most decorative (apart from ‘Sun’, ‘Moon’ and ‘Earth’) are probably the colourful ‘Autumn’ ‘Spring’ and ‘Invitation’ by Eve Midwinter and ‘Nasturtium’ and ‘Caprice’ by Jessie Tait. The more restrained ‘Wild Oats’ by Eve Midwinter released in 1974 was enormously popular with the public. Other patterns of interest are ‘Melons’, a sophisticated re-working of a Clarice Cliff original on a glossy, white glaze background. 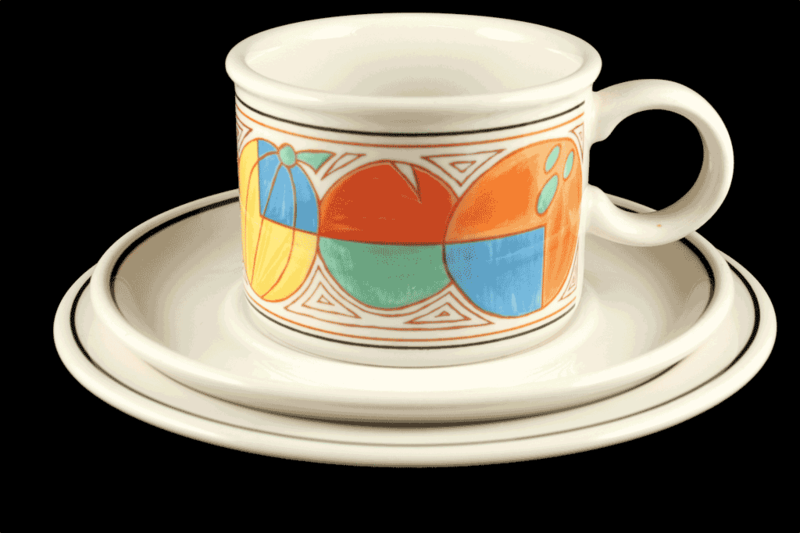 This reflects Wedgwood’s use of the intellectual property represented by the patterns created by Clarice Cliff in the 1920s and 1930s at the Newport Pottery Co. Ltd (later owned by Midwinter and subsequently Wedgwood). 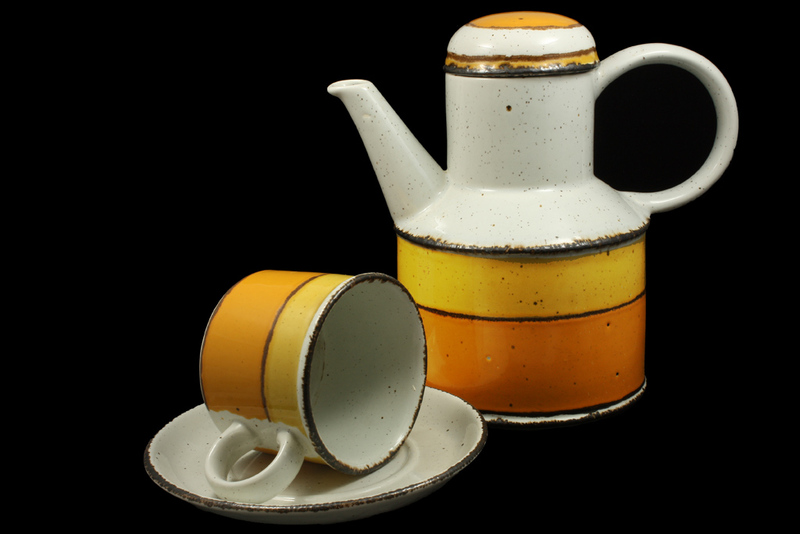 ‘Crocus’ and ‘Oranges and Lemons’ are also versions of Clarice Cliff designs. The majority of Stonehenge patterns were released between 1972 and 1974. The earlier matt-glazed wares were withdrawn in the mid-1970s, however, most patterns remained in production until withdrawn by Wedgwood in 1982 or 1983. ‘Sun’, perhaps the most popular and iconic Stonehenge pattern is believed to have remained in production until 1987. Wedgwood expanded the original range of Stonehenge shapes where is saw a market opportunity, and some of the later Stonehenge production may have been under the Johnson Bros label. Of the originators of Stonehenge, Roy Midwinter left Wedgwood in 1981 to found a design studio. He died in 1990. Jessie Tait moved from Midwinter to the Johnson Bros division of Wedgwood in 1974 – after nearly 30 years with Midwinter. Eve Midwinter, the real innovator behind the phenomenal popularity of Stonehenge remained with Wedgwood until 1986 before becoming an independent designer. 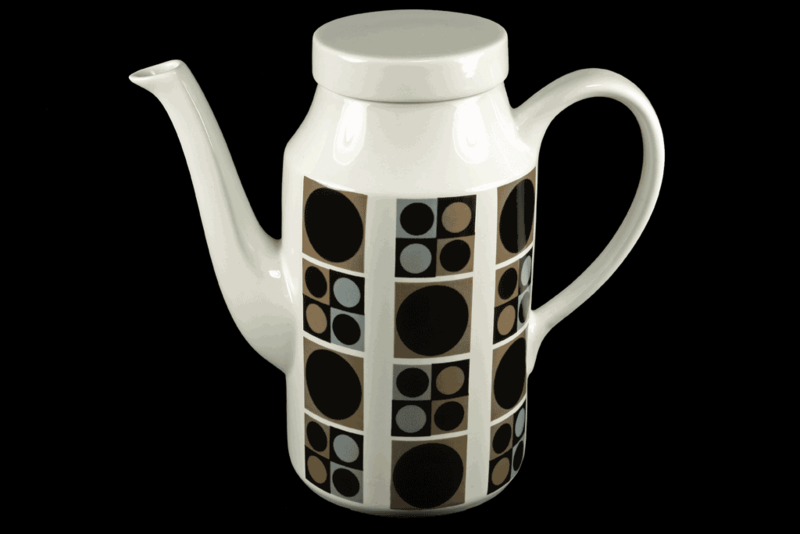 Other Midwinter shapes include Hudson (1946), Trend (1966), Portobello (1967), Stoneware (1972), Style (1983) and Reflex (1986). More important, however, are the animal models designed by Colin Melbourne and produced in the late 1950s. 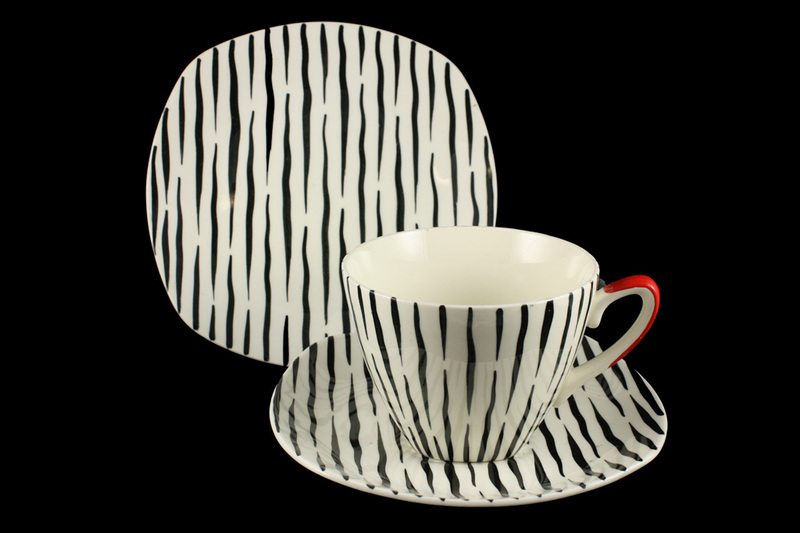 These are abstract in form with a white or black matt glaze and are now regarded as highly collectible.